Discussion in 'General Affiliate Marketing Forum' started by Linda Buquet, Jul 27, 2006. I've been waiting for someone to come up with a fun, unique spin on the "sell a word" craze. Chris Pirillo from Lockergnome has had the RentMyChest site for a couple years and used to sell ads like the one in the pic written with magic marker for $20. He just upgraded the site and is now using Joel Comm's Link Sizzler software but is putting a different twist on the concept. I just bought AFFILIATES since the site is PR 6 and knowing Chris, it will attract lots of webmaster traffic. Checking out Alexa I already see a huge spike in traffic and the new word cloud upgrade just launched. ReNt mY cHEsT - Click to see my "Affiliates" link! PS - If you need webmaster traffic or dare I say a PR boost, this is a pretty cheap way to advertise and could generate a decent amount of traffic if it takes off. HINT: you could even advertise your affiliate programs here with a direct affiliate link. I just submitted my blog about this story to Digg. If you like it - Digg it! Oppps I guess the Diggers hate it - or me! Too funny Jamie. Almost spewed coffee on my monitor! 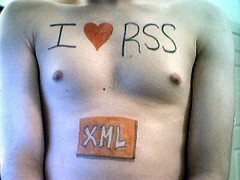 Actually his REAL chest is in the pic on my blog. It's bigger than Arnolds, but in a different way. I am glad you liked my Friday funny.